For once the wet forecast wasn’t a big fat fib. Lovely, lovely rain hissing down quietly and steadily. I’m guessing this will end in a Full Smith Period, but I don’t care. My last spuds are nearly ready, I am crossing fingers the greenhouse will be protected and the plots will be so much happier for it. It may even encourage the squashes into more action! Yesterday was a big day – the saffron bed finally got finished and………it’s too small. Argh!! I didn’t take them all out till the bed was done and there is very little information on how quickly they multiply. I originally had 60 fat corms last year. The ones I put in the ground last have quadrupled on average (but flowered less) and the ones in the pots doubled (but were a bit smaller and flowered more). Now I have 108 in the new bed (12 rows of 4 huge corms and 10 rows of 5 smaller ones), spaced at approx 10-15cm and 10-15cm deep. The bed had a bale of MPC, most of a box of BFB and 2 barrows of rotted manure from my stash. There is a lot of air in the bed, so it will settle, but then I can top up with more manure after flowering to feed the corms some more. In trying to finish more quickly I managed to thwack myself in the face with the spade handle (skillz!) so I’m left with a fetching bruise purpling nicely on my cheekbone. Really made my eyes water! I am also left with a litre of small cormlets, about 1.5cm in diameter and I am not sure what to do with them. They are too small to flower this year, though they might bulk up enough for next year. I can stick about half in pots, but the rest….? On the rest of the plot most things are doing well. I’ve even started getting autumn raspberries from the new canes and they are wonderful, big, fat berries. The greenhouse tomatoes are really marching on and I think we are about to be overwhelmed. I am starting to have a tomato salad nearly every day and am sneaking them into as many of our meals as possible. 3 litres yesterday – including the very first Orange Banana, thanks Baldy for the idea of growing these, it was lovely and there are loads more to come. 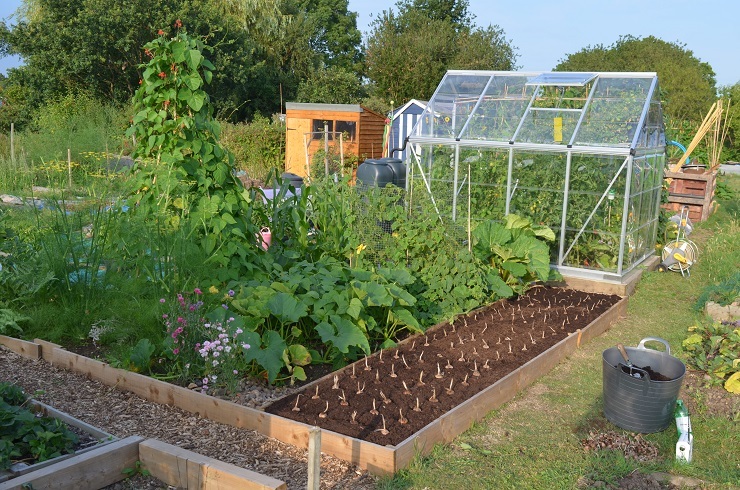 Up on the other plot I have a few slugs in with my winter veg and need to put pellets or traps down. 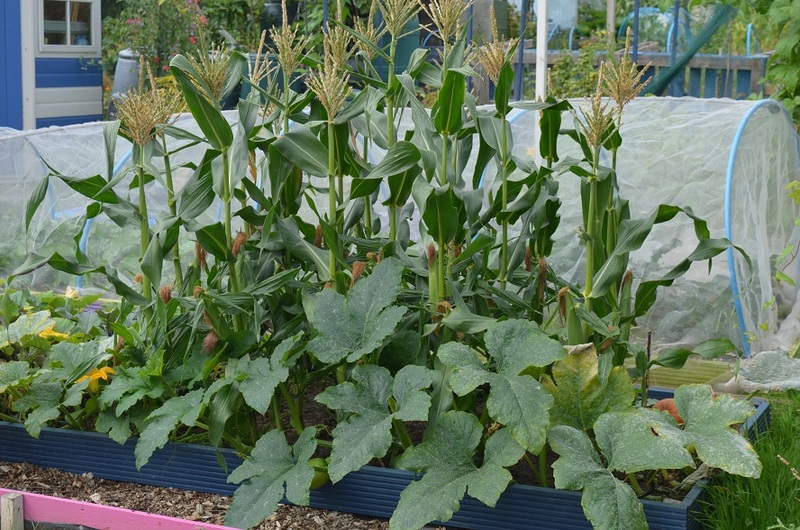 The sweetcorn is fattening up nicely and this year I should have more than one cob per plant and hopefully they won’t all come at once as our freezer is not big. Now that the saffron bed is done I can get on with the large queue of other jobs on plot 100. Starting with topping up all the manure bins and doing some weeding & tidying as bits of it have got way out of control.